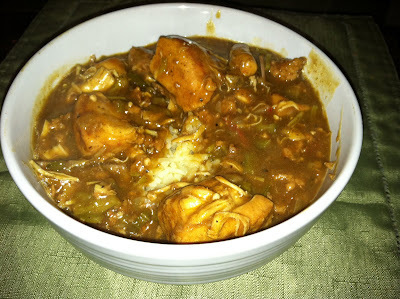 Our May hostess, Denise, of There’s a Newf in My Soup!, challenged The Daring Cooks to make Gumbo! She provided us with all the recipes we’d need, from creole spices, homemade stock, and Louisiana white rice, to Drew’s Chicken and Smoked Sausage Gumbo and Seafood Gumbo from My New Orleans: The Cookbook, by John Besh. Gumbo originated in Louisiana in the 18th century, combining culinary influences of several cultures including French, Spanish, Italians, and Germans, and has become the regional dish of the Big Easy. The most common varieties of gumbo include seafood or meat, and can be classified as "Cajun" or "Creole," depending on the spices used. An important component of any gumbo is the thickener: okra, file, and/or roux. We knew this gumbo would feed us for awhile, so we decided to make the chicken and smoked sausage gumbo, purely for re-heating purposes. The gumbo combined with Louisiana white rice was smoky and spicy, and had the consistency of gravy. It's like Mardi Gras in your mouth, any time of the year. 1. Prepare homemade Basic Creole Spices, if using (recipe below). 2. Season the chicken pieces with about 2 tablespoons of the Creole Spices while you prepare the vegetables. 3. Make sure all of your vegetables are cut, diced, chopped, minced and ready to go before beginning the roux. You must stand at the stove and stir the roux continuously to prevent it from burning. whisking until the roux becomes deep brown in color, about 15 minutes. 5. Add the onions. Switch to a wooden spoon and stir the onions into the roux. Reduce the heat to medium-low. Continue stirring until the roux becomes a glossy dark brown, about 10 minutes. 6. Add the chicken to the pot; raise the heat to moderate, and cook, turning the pieces until slightly browned, about 10 minutes. 7. Add the sliced smoked sausage and stir for about a minute. 8. Add the celery, bell peppers, tomato, and garlic, and continue stirring for about 3 minutes. 9. Add the thyme, chicken stock, and bay leaves. Bring the gumbo to a boil, stirring occasionally. 10. Reduce the heat to medium-low and simmer, uncovered, for 45 minutes. Stir occasionally, skimming off the fat from the surface of the gumbo every so often. 11. Add the chopped andouille, okra, and Worcestershire. Season with salt, pepper and Tabasco, all to taste. 12. Simmer for another 45 minutes, continuing to skim the fat from the surface of the gumbo. If the gumbo doesn't thicken to your liking, stir in cornstarch (mix 1 part cornstarch to 1 part water before adding it to the gumbo - we only needed 1 tablespoon of each). Remove the bay leaves and serve in bowls over Basic Louisiana White Rice (see recipe below). Your gumbo looks great!! Good job! What a beautiful shade of brown you got on your broth! Looks delicious!